Gold bullion investors have a wide variety of offerings, and this addition just increase the variety that can be found. Gold Panda coins were first minted in the year 1982, and contain a picture of the Panda bear, a symbol of the issuing country located on the front. Opposed to many other bullion coins, Pandas come out every year with a new design for the back that still bears the national animal but in different settings. The first year these were minted there were only four sizes offered. The following year China added a fifth size, so that even those with modest investment budgets could purchase them. Investors and collectors alike should be advised that even larger sizes of these are available in 5 oz, 12 oz and even a full kilogram of pure gold! This fact will sure attract not only investors but numismatic enthusiasts. Granted that Pandas are struck in limited mintages, they are not only an excellent investment but a great addition to your collection. The sizes of gold Panda coins are similar to other choices of this type. The gold Maple Leaf coins are also offered in the same sizes, which are the one ounce, the one half ounce, the one fourth ounce, the one tenth ounce, and the one twentieth ounce sizes. These ranges make it easy for all investors to buy the largest amount possible. British Sovereign gold coins are available in different designs, rather than specific sizes, and are one of the most well known selections in the world. 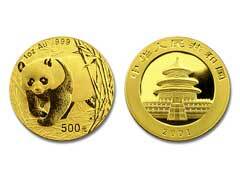 With the introduction of the Panda gold coins, China has earned a place on the market for precious metals investment. These are also legal currency in China, just like the Krugerrand gold coins are in South Africa, and they have a currency value stamped on them. Up until the year 2001, the face value on gold Panda coins was much lower than it is currently. The one ounce coin was one hundred yuan, now it is five hundred. The half ounce coin went from fifty to two hundred yuan, and the quarter ounce changed from twenty five yuan to one hundred yuan.